My Amino Energy Review- How Does it Perform? Amino Energy is sort of in a weird class of supplements. Since it does have a decent stimulant dosage in it, I am calling it a pre workout. Optimum Nutrition has it classified on their website as being in the 'strength and recovery' class of products. Looking at the supplement facts- it's really pretty confusing why Optimum felt the need to make this product more about the aminos and recovery. Because I'm going to be honest, this has all the makings of a pre workout. I'll go into more detail in the supplement facts/ingredient review section. For now, let me tell you a little bit about how Amino Energy worked for me in terms of workout performance. But Even before that, how does Amino Energy taste? 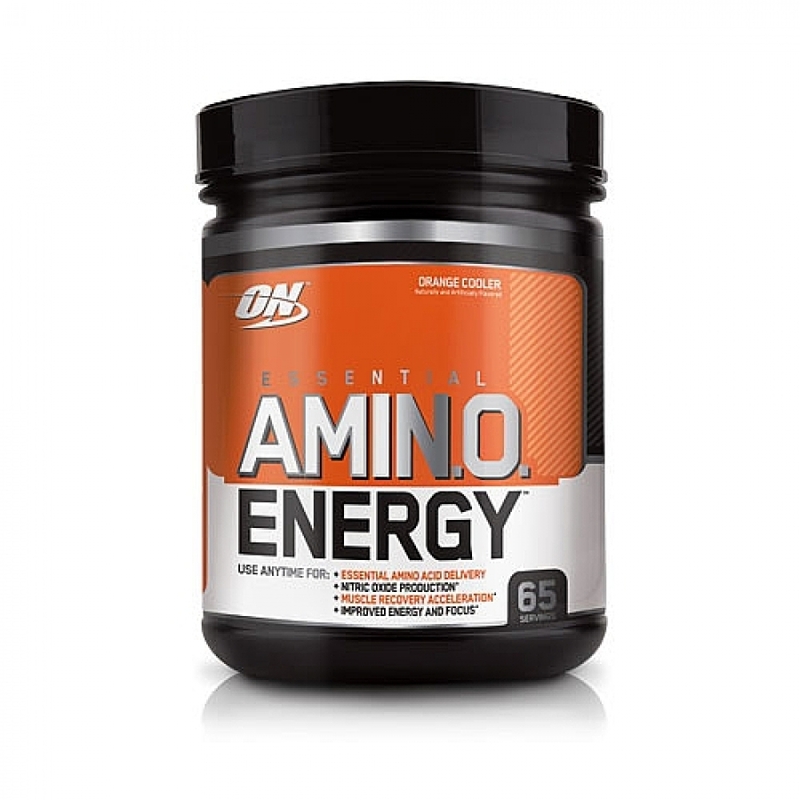 Amino Energy tastes about exactly how you would expect an orange-flavored supplement to taste. It wasn't quite as 'orange juice-y' as I had hoped, but then again, it's tough to compare to the taste of 40g of sugar per cup (or something like that). If I had to compare the orange flavor to something else, it would probably have to be orange Gatorade or something like that. It wasn't the most natural tasting orange flavor, but it was definitely citrus-y and had a good balance of sweet and bitter. I wish I could come up with more comparisons and more things to tell you about the flavor itself, but, I mean, it's orange. It tastes exactly how you think it tastes. It's not unbelievable and it's not gross. That's why I gave it a B+. For supplements, it's pretty good. Since I took Amino Energy as a pre workout, I have to review it from the standpoint of how it impacted my workout. Like I mentioned, I got a fresh 30 serving tub of Amino Energy from my local GNC for just $24 bucks (more on THAT later). I grabbed the orange flavor basically because nothing else sounded that great at the time. Plus it was pretty early so I was thinking of orange juice and how nice that would be. I mixed two level scoops of Amino Energy into an ice cold glass of water and stirred it up with a spoon. Someone told me recently that you aren't supposed to shake your pre workout because it can compromise some of the effects or something. I don't know from a scientific standpoint how that could possibly have an impact on how the product works, but whatever. The workout that I had on my plate today was, well, I didn't have one in mind at all. My neck is getting better day by day, but I was still afraid to really go after the weights today. But naturally I over-ruled the smarter voice inside my head and decided that a little mini-weight session couldn't hurt anyone right? After all, 3 days straight of only cardio was starting to get to me. You know how easy it is to lose muscle tone without lifting! So after a VERY thorough warming up of my neck and upper back, I started in with a back-to-back superset series of smith machine split squats and barbell military press. I know. If you've ever had the pinched nerve in your shoulder blade like I've had, you probably just cringed reading that. Military press is notorious for firing up shoulder and neck pain. But I figured that it was important to get some of that range of motion going again. Plus, my delts have looked awful lately. I put some relatively light weight on the bar and got into it, focusing on pushing straight up and back while pushing my head and chest 'through'. My first set felt great as I felt Amino Energy start to contribute its effects. The noticeable effects were of course the beta-alanine tingles and the familiar burst of caffeinated energy. My initial set of split-squats went down without much resistance. Of course I was using light weight for this as well, but still, I felt really good. When I started the workout, I had planned on doing about 4 supersets (ie four milt. press paired with four split squat sets). After I finished my fourth and final set of split squats however, I was just starting to feel like my muscles were getting warmed up. And that's what a heavy does of amino acids can do for you. They will be readily available in your bloodstream and spare the body from having to contribute those energy substrates from skeletal muscle. It makes a huge difference in strength and endurance. Combine that with the near 300 mg of caffeine that I got via the 2 serving dosage that I took, and I had myself a recipe for a terrific workout. I ended up doing four additional sets after my first four, for a total of 8 good solid working sets without missing a rep, or feeling like I was straining my neck. All in all it was one of those workouts that I had incredibly low expectations for, and ended up being fantastic. And I can give most of that credit to the Amino Energy pre workout. So the product performs great. But why? Is it just caffeine and aminos supplying the power? Or is there more than meets the eye? Let's peak under the hood and find out. The formula is nothing crazy and nothing you've never seen before, but it is quite effective as a pre workout. I think the significant dosages of taurine, glutamine, and caffeine really are the money makers in here. Let's finish up with a quick review of Amino Energy packaging, and then close out with my final assessment of this pre workout's value. This is the second 'B' that I'm awarding in this review. Amino Energy appears as such a 'normal' product that it's hard to give it much higher of a grade than this for their kind of 'by-the-books' style packaging. Don't get me wrong. There is absolutely nothing wrong with Optimum's packaging. They've worked very hard for a long time to cement themselves as one of the most reliable supplmeent companies in the world- and of course the packaging has echoed that messaging. It uses big, clear, fonts. It uses big, blocky, trust-worthy graphical elements to make it very clear what you are buying, and for what purpose. From a design perspective, it's hard to argue with that. But the artist in me will always yearn for something more in Optimum Nutrition's packaging. I want it to make me feel something, and not just tell me something. So for that reason I give Optimum Nutrition packaging just an average grade.